For some status-conscious, instagraming travelers, airline-branded pajamas are among the most potent status symbols of a jet-setting life. Sure, they’re often gaudy, with airline logos — such as the Qantas flying kangaroo — printed on them. And they’re sometimes scratchy, which shouldn’t come as a surprise because by one insider’s estimate, pajamas cost airlines no more than $10 per set, and usually far less. But they’re not easy to get. Not every airline offers them, and many, including Lufthansa, Singapore Air and Cathay Pacific, hand them only to first class passengers. Passengers strutting around in ill-fitting airline-branded pajamas may look ridiculous, but they can feel confident knowing they’re wearing an outfit few ever will own. At least one airline, however, is turning pajamas into a revenue producer. Late last year, Etihad began selling economy class passengers the same style of Christian Lacroix-branded sleep suits available free in its “First Class Apartments.” For $35 per pair, passengers on all ultra-long-haul routes, except to the United States, may strut through the cabin like a first-class rainmaker. There’s more, too. On the ground, Etihad’s coach customers can buy access not only to business class lounges, but also to its more opulent first class clubs, with two hours at the Abu Dhabi flagship going for $200 per head, excluding spa treatments. 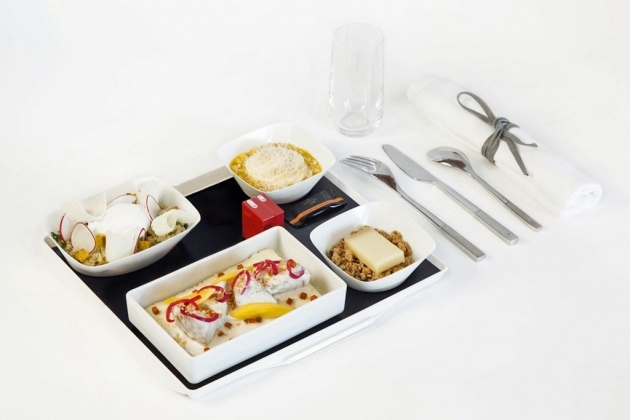 On board, in addition to pajamas, economy class customers can buy premium amenity kits ($22), Piper-Heidsieck Cuvee Brut Champagne ($8 per glass) and, on some flights, passengers can buy artisan iced coffee ($4 each). Etihad, which is in considerable fiscal distress, is taking its amenity-selling strategy further than most airlines, so it can raise cash while giving customers, “power and control over their experience,” according to an airline executive. But many airlines now sell premium- style amenities, including lounge access, improved food, and better-quality wines to customers wedged into coach seats. Even Etihad’s Gulf rival, Emirates, will sell economy class passengers some first class perks, such as a visit to its opulent lounge in Dubai.